NDO – Party and State leaders paid their visits to many agencies and enterprises around the country on February 11 - the first working day after the nine-day Tet (Lunar New Year) holiday. At the working session with Vietnam Posts and Telecommunications Group (VNPT), Deputy Prime Minister Vuong Dinh Hue extended his greetings to its officials and employees on the occasion of the 2019 Lunar New Year. He asked the Group to affirm its role and leading position in developing e-Government and digital transformation in Vietnam in 2019. The Deputy PM also noted that VNPT should continue to arrange its organisational structure in management, production and business activities. On the same day, Deputy PM Hue visited the Vietnam Bank for Agriculture and Rural Development (Agribank) and the Committee for Management of State Capital at Enterprises (CMSC). He asked Agribank to pay great attention to restructuring for the second phase, promoting its leading role in investment credit for agriculture, rural areas and farmers. The Deputy PM asked the Committee to deeply study the history, culture and situation of each enterprise to set appropriate management methods as well as consolidate and arrange its apparatus, meeting the new requirements and tasks. On the occasion of Lunar New Year, Politburo member and Minister of Public Security General To Lam attended an online conference held by the Ministry of Public Security, urging the strict implementation of major tasks this year. 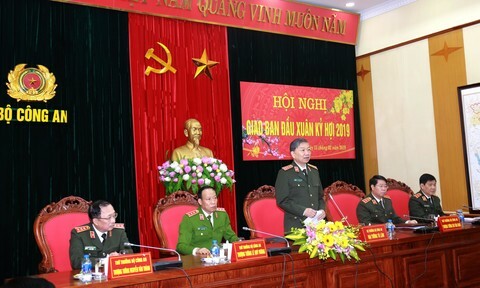 In addition, Politburo member and Secretary of Hanoi municipal Party Committee Hoang Trung Hai chaired the Committee’s meeting to review the capital city’s situation during the Lunar New Year holiday, while Politburo member and Secretary of Ho Chi Minh City Party Committee Nguyen Thien Nhan visited its agencies.